Melbourne-based company Independent Products wins Company of the Year at ATC for its retrofit ultra-efficient cooling technology. A Melbourne-based company whose Energy Reclaim Kit technology re-uses air-conditioning waste-water to produce ultra-efficient cooling has won top honours at this year’s Australian Technology Competition, taking out the title of Company of the Year. Independent Products was awarded the top ATC prize for its retrofit air-con and refrigeration technology, as well as winner of the competition’s Smart Cities category at an awards ceremony in Sydney on Wednesday night. NSW-based Wattwatchers, whose industry-leading energy management technology we have written about here on a number of occasions, was also a winner, taking out top prize in the category of New Energy. But its potential for growth has been recognised – not only by the ATC judges, who described this as “significant” – but by some of Australia’s heavy-hitting clean tech investors, including Mike Fitzpatrick’s 88 Green Ventures. It has also has established manufacturing facilities in Melbourne and Queensland to meet growing market demand – and as it looks to take its product to the global market. “The team at Independent Products is honoured to be the overall winner of ATC16 and winner of the Smart Cities Award,” said the company’s founder and CEO, Steve Heaton. “It is recognition not only of the product but also in our great business model and governance. This win is perfect timing for us as it will help us raise our profile at a time leading into summer sales,” he said. In its six years of operation, the Australian Technologies Competition has identified more than $250 million dollars in contestable project opportunities for Australian SMEs. O’Brien says he is on a mission to turn great technologies into great businesses. “We aim to find the best companies, provide them with the best mentoring possible and connect them with global partners. We want to help create multi-billion-dollar global success stories,” he said. “Independent Products is set for very significant growth both at home and internationally. It is such a simple concept but one that will have a global impact on energy use. Past winners of the competition have included BluGlass, Enlighten Australia and SMAC Technologies. How much more efficient than a Dakin inverter a/c, I wonder? Yes, they need to measure results on a few models of well known brands and publish the results. I have been assisting the inventor since he was a student. The same bloke has other tech that is even better. I also purchased his very first unit. I know Dakin were early into inverter but my experience total dud had to replace it only after 5 years and 2 refits. They should start promoting R290 and work on units that are easily maintainable.. just look at any split system after it’s been running for 5 years and tell me how one is supposed to clean/maintain that thing without breaking it. Just did our 2 reverse cycle systems (5 years old, Fujitsu) for the 2nd time in their life.. I can’t clean the fan blades of the indoor unit. They are covered with mould/gum/etc.. also the dissimilar metals start to corrode. I give it another 5 years. The outdoor unit doesn’t look much better. And the worst part – if nothing is available of the shelf I have to learn how to built it myself. Dammit. 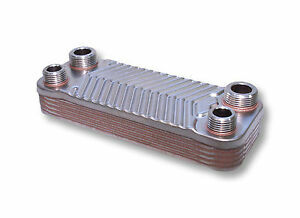 And the interesting part is: this highly efficient heat exchanger was commercially available in 1983! It frustrates me to find that the price of this product seems a closely guarded secret – I’ve lost interest, assuming right now it’s well out of reach.